The goal at Argus was to create a robust and reliable Active RFID Platform ensure the barcode system software, integration, deployment and maintenance does not drive up your total cost of ownership. Real Time Location System (RTLS) deployment and maintenance are key cost drivers over time – we designed our affordable Argus platform to acquire RFID tags quickly without data collisions and robust, created customizable RFID tags to fit the application and the overall system to reduce total cost of ownership. The Argus RTLS platform is the core of our technology. It is comprised of barcode RFID tracking software, locating algorithms, database management and RFID hardware components. We built the RTLS technology for easy integration, and supply a software development kit and “Test App” to speed integration of third party apps and peripherals. Argus active RFID tags are the other key component of our technology. Built to operate with the Argus RTLS platform, we offer a variety of active RFID tag features and RTLS enclosures not only for healthcare but also a multiple of industrial and enterprise applications and use cases. ‘What do our RFID tags cost?’ This is a critical question for total cost of ownership (TCO) because the market is driven by reliability and system affordability. We designed our RFID tags and RTLS system with the end goal of converging the cost of active RF systems with passive systems. What is your application and what features do you need? We either already have a RFID tag that will meet your needs or can OEM a combination of features for you. All our RFID tags are constructed from durable polycarbonate and can be custom colored for different applications. Battery life will depend on; beacon rate, environment and power draw of the features required. Even with such a small footprint, our RFID tags have a remarkable battery life. We will walk you through the various RFID tag options to choose the features that work for your application – for example, where contamination is an issue – like foodstuffs or healthcare, use our short battery life tag. 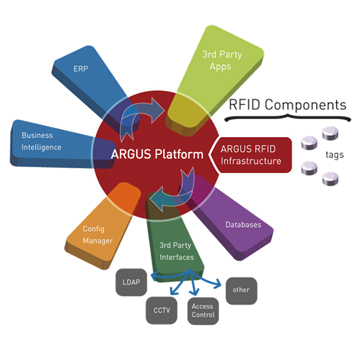 Guard RFID’s Argus Platform is a highly configurable Active RFID platform regardless of application or use case. Enterprise, industrial, manufacturing and security applications can all use the platform for protection, identification, tracking and location of people and assets. Southwest Solutions Group is proud to be an integration solution partner with Argus technology. Argus has used their years of healthcare experience to build active RFID-based RTLS solutions for monitoring patients & staff and managing assets. We specialize in delivering secure, reliable RTLS solutions that drive Return On Investment. Caregivers need an easy to use, reliable system. Residents and patients need privacy and effective, unobtrusive monitoring. Administrators need cost effective solutions that integrate with operations intelligence, third party peripherals and applications for a variety of facilities. 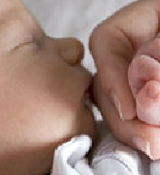 Ensuring that newborn patients are well cared for means doing more than just providing excellent clinical services. Along with your standard security procedures and resources, TotGuard protects these tiny patients using the latest in RFID technology that supports alerts and alarms triggered by the TotGuard tags. TotGuard tags are the smallest active RFID tags on the market, improving comfort and making it easy for you to apply to the tiniest of infants. It is also the first disposable infant RFID tag in the world, making biohazard risk a thing of the past, while helping you with your bottom line. TotGuard supports unique dual-tamper sensing ankle/wristband tags so you can select what best suits your facility. TotGuard gives you the confidence that you have done your best to keep your most vulnerable patients safe and sound where they are supposed to be when you install TotGuard. Aging may bring with it limitations to one’s independence. Wandering and disoriented patients & residents can come to harm if they go astray, but limiting their freedom can cause unnecessary stress and anxiety – in addition to loss of dignity. SafeGuard gives patients freedom while you keep a virtual eye on them – making sure they don’t get into harm’s way in a gentle and respectful manner. SafeGuard offers easy installation, is simple to learn, and easy to use. It provides you with configurable alarms, and notifies your staff of events wherever they may be – at a desk or on the move. Patient/resident RFID tags are smaller than any others available, and designed to be removed only by qualified staff. So while they are unobtrusive and comfortable, they also give you peace of mind. The system uses existing 802.11 and Ethernet networks, so there are no expensive built-outs or wiring needed. The user-friendly graphical user interface includes wizards to help staff and system administrators use the application with ease, making configuration, training and ongoing use quick and painless.